Se espera que las ventas netas estén entre $ 51.0 mil millones y $ 54.0 mil millones, o que crezcan entre 34% y 42% en comparación con el segundo trimestre de 2017. Les anticipo: a mitad de año habrán superado los 100 mil millones de dólares de venta, y superará a final de año ampliamente los 200.000 millones de dólares. Estará alrededor de los 230.000 millones de dólares . Pronóstico que yo argumenté que ocurriría en 2018 en este blog a principios de 2017. Superar los 200 mil dólares es algo que solo ha hecho un retailer en la historia: Walmart. Los cuales superaron esa barrera en 2001, y han estado 21 años superándola exponencialmente. Amazon se unirá al club (hasta ahora reservado el derecho de admisión a un solo socio) de los retailers >200K millones dólares. Lo que podemos ver es que el comienzo del año ha sido extraordinario en términos de volúmenes de venta. Superando un 43% las ventas del mismo período de tiempo en 2017. Y tengan en cuenta que las grandes ventas vendrán en el 4Q, donde se junta el Prime day con las ventas de navidades. 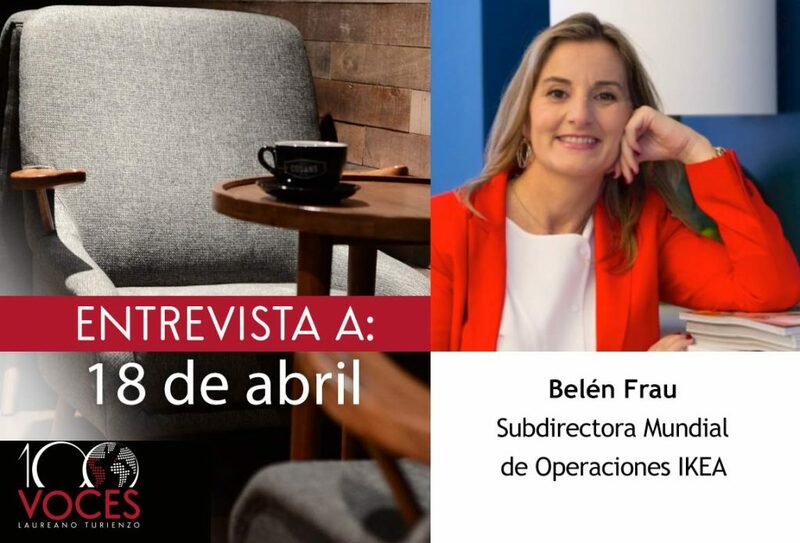 Pero si analizamos el trailing twelve months (TTM), veremos que en los últimos 12 de operaciones ya rozan a los 200.000 millones de dólares, superando en un 36% el TTM del 1Q2017. 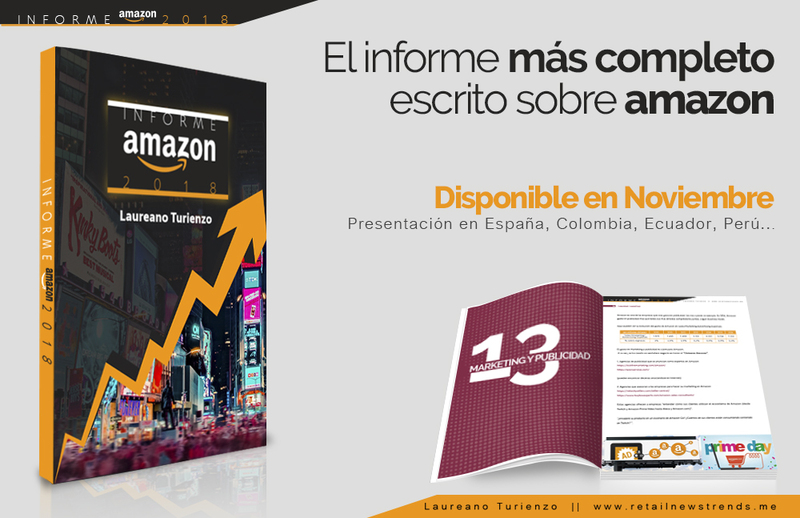 Y atención al TTM de Internacional donde están cerca de los 60 mil millones de dólares (Amazon Internacional por si sola, estaría entre los 18 retailers más grandes del mundo, facturando casi el triple que Mercadona), Y recordemos que casi todas estas ventas se han generado en tres países: Alemania, Japón y Reino Unido. Y con una contribución menor en Italia, España, Francia, México y Canadá. Mi pronóstico es que cerrará 2018 en unos 750000 millones de euros, por lo que por si sola Amazon internacional podría estar entre los 10 retailers que más facturan del mundo. Ésa es la parte bonita de la historia, la fea: es precisamente en Internacional lo que penaliza los resultados de Amazon. Es donde pierde dinero, debido a las inversiones que están haciendo, sobre todo en logística. Pero de eso se trata la estrategia Flywheel: invertir a largo plazo. Y desde luego están creando un ecosistema (sobre todo en Europa) para dominar el mercado de muchos países de forma aplastante en la década de los 20. Y mucha atención a los próximos meses a India. Como hace tiempo les indico: el gran objetivo de Amazon, aparte de Estados Unidos, será India, una vez perdida China. En el caso de AWS, la joya de la corona, la evolución de las ventas son extraordinarias. Y sobre todo el margen que les deja. DATOS QUE USTED DEBERÍA SABER. Vayamos más lejos. Seamos más ambiciosos. Pongamos la lupa en una serie de datos que son claves, y que seguramente pasarán desapercibidos en los titulares. Observemos los números desde más cerca. “Earning call” es una conferencia telefónica entre una empresa pública, analistas, inversores y medios de comunicación para analizar los resultados financieros de la empresa. Les dejo algo que les aconsejo leer, ya que es de gran valor para entender estos resultados. 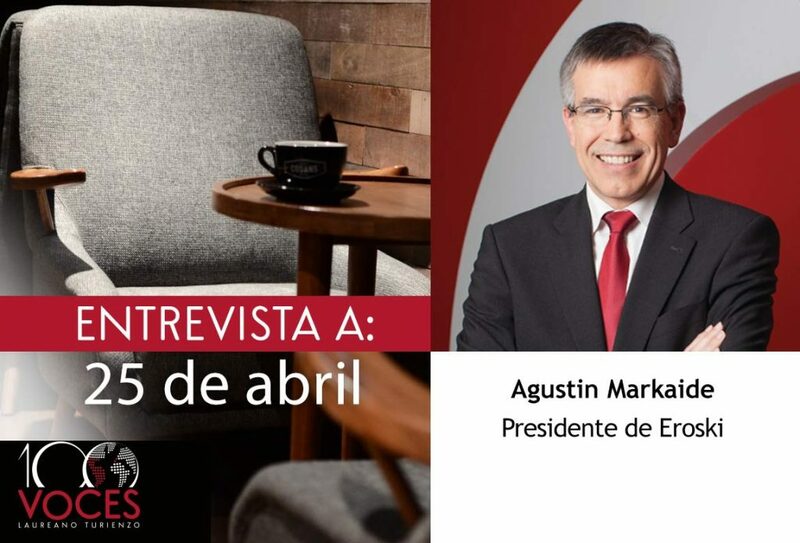 2- El programa . Ahora está disponible en más de 100 millones de artículos en entregas de 2 días , frente a los 20 millones en 2014. Dave Fildes – Amazon.com, Inc.
Brian T. Olsavsky – Amazon.com, Inc. Thank you for standing by. 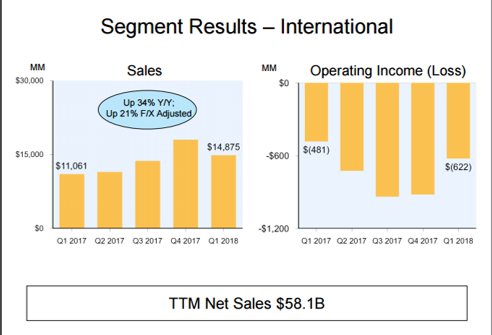 Good day, everyone, and welcome to the Amazon.com Q1 2018 Financial Results Teleconference. At this time, all participants are in a listen-only mode. After the presentation, we will conduct a question-and-answer session. Today’s call is being recorded. For opening remarks, I’ll be turning the call over to the Director of Investor Relations, Dave Fildes. Please go ahead. Hello, and welcome to our Q1 2018 financial results conference call. Joining us today to answer your questions is Brian Olsavsky, our CFO. As you listen to today’s conference call, we encourage you to have our press release in front of you, which includes our financial results as well as metrics and commentary on the quarter. Please note, unless otherwise stated, all comparisons in this call will be against our results for the comparable period of 2017. Our comments and responses to your questions reflect management’s views as of today, April 26, 2018 only, and will include forward-looking statements. Actual results may differ materially. Additional information about factors that could potentially impact our financial results is included in today’s press release and our filings with the SEC, including our most recent annual report on Form 10-K and subsequent filings. Our guidance incorporates the order trends that we’ve seen to date and what we believe today to be appropriate assumptions. Our results are inherently unpredictable and may be materially affected by many factors, including fluctuations in foreign exchange rates, changes in global economic conditions and customer spending, world events, the rate of growth of the Internet, online commerce and cloud services and the various factors detailed in our filings with the SEC. Our guidance also assumes, among other things, that we don’t conclude any additional business acquisitions, investments, restructurings or legal settlements. It’s not possible to accurately predict the demand for our goods and services, and therefore, our actual results could differ materially from our guidance. With that, we’ll move to Q&A. Operator, please remind our listeners how to initiate a question. At this time, we will now open up the call for questions. Our first question comes from line of Eric Sheridan with UBS. Please proceed with your question. Thanks so much for taking the question. I wanted to ask if you had any update on the state of the advertising business, sort of the state of conversations with advertisers, what product uptake you’re seeing out in the marketplace, and sort of how that’s looking now as we move out of 2017 and into 2018 broadly for the platform? Thanks so much. Yes, sure, Eric. I would say advertising continues to be a bright spot both from a product standpoint and also financially. It continued to be a strong contributor to profitability in Q1. It’s now a multibillion-dollar program. 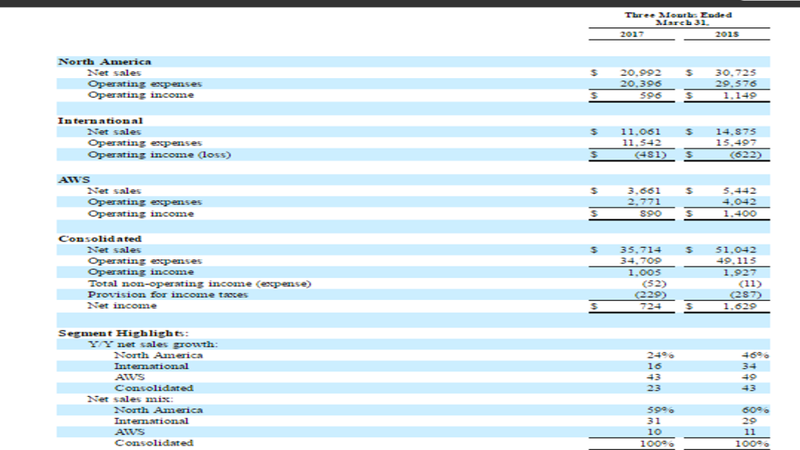 You can see the – in our supplemental revenue disclosure, it’s in other revenue, and it’s the majority of the other revenue in that line item. So our philosophy there again is we’re continuing to focus on finding valuable ways to make our advertising opportunities better for customers, showing them new products that they may not have seen otherwise and also for emerging and established brands, helping them to reach customers. I think the advertisers generally are in all shapes and sizes, and their common theme is that they want to reach our customers generally to drive brand awareness, discovery and eventually purchase. Before I go into the second question, I want to make a comment about the Prime program. Prime program continues to drive great strength in our top line, as you’ve seen over the last few years actually. We continue to increase the value of Prime, including speed selection and digital entertainment options. We’ve been expanding FREE Same-Day Shipping and One-Day options. And our Two-Day shipping, it’s now available on over 100 million items, up from 20 million as recently as 2014. And we continue to add digital benefits like Prime Video. The value of Prime to customers has never been greater. And the cost is also high, as we pointed out especially with shipping options and digital benefits, we continue to see rises in costs. So effective May 11th, we’re going to increase the price of our U.S. annual plan from $99 to $119 for new members. The new price will apply to renewals starting on June 16th. Prime provides a unique combination of benefits, and we continue to invest in making this Prime program even more valuable for our members. As a reminder, we haven’t increased the U.S. annual price of Prime since our single increase, which was in March of 2014. Yeah. And Eric, sorry to just go back to your initial question, to just hop back on that, just want to remind folks that we’ve mentioned this last quarter on the call, but on January 1st, we adopted an accounting standard update that amended our revenue recognition policies. So, the net impact to revenue in the first quarter was not material, but I do want to highlight a few areas. As part of the adoption beginning in Q1, certain advertising services were classified as revenue rather than a reduction of costs to sales. So the impact of this change was an increase of $560 million to other revenue in Q1, which is the other revenue was, of course, part of our supplemental sales disclosure. 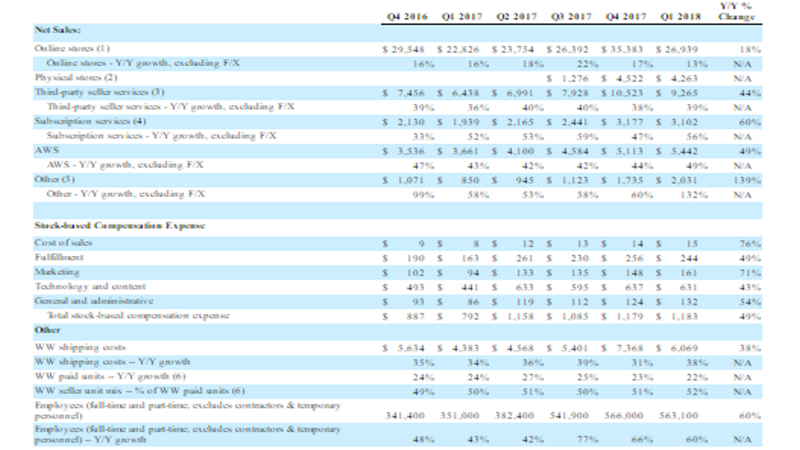 So you’ll see that other revenue, in total, increased 132% ex-FX year-over-year to about $2 billion in the first quarter, again, $560 million is included in there, and the majority of that is – would be included in the North America segment. As you look at the other supplemental line item, just a few items of note. The line item online stores revenue increased about 13%, ex-FX. Beginning in the first quarter, sales of apps, in-app content, certain digital media content are now presented on a net revenue basis and included in third-party seller services revenue rather than net online stores revenue. So in the first quarter, online stores revenue would have been higher, but for this new standard. And then the line item, subscription services revenue that increased about 56% ex-FX year-over-year. Prime memberships are included in that line. Again, beginning in the first quarter, we now recognize annual Prime membership revenue straight line over the 12-month period. Prior to 2018, we recognize this revenue over the 12-month period with more revenue allocated to the fourth quarter each year. So, in Q1 of this year, subscription services revenue would have been lower, but for this new standard. Thank you. Our next question comes from Brian Novak with Morgan Stanley. Please proceed with your question. Thanks for taking my questions. So the first one on Prime, let me ask you this. As you think about your U.S. Prime penetration, there’s some data that shows you’re doing a very good job at capturing a lot of the middle to higher income households and now you’re raising price. Talk about the tension point you need to solve to sort of reach some of the lower income households and even households that are not yet Prime. What are the main reasons why people in the U.S. are not signing on for Prime at this point? And the second one on early learnings from the integration of Prime Now and Whole Foods, recognizing it’s only in a few cities, what can you share about what you’re seeing about purchase behavior, early learnings? And what are the main signposts you’re watching as you determine how quickly to roll that out to more cities in the U.S. and hopefully, New York soon? Sure. On your first question about Prime penetration, without getting into any statistics on penetration and by country, I would say we do have other options for, if you’ll notice, there’s the monthly option, obviously provides more flexibility for people who want to try out Prime before committing to the annual plan. There’s discounted student plans. There’s also discounts for other groups. So, we do feel it’s still the best deal in retail, and we just work to make it better and better each day. The second thing you mentioned is a good example. So, the ability in 10 cities to get Prime Now deliveries of Whole Foods groceries is an added benefit for people in that market using Prime – those markets using Prime Now. So as far as the Whole Foods, specifically on the question of what we’ll look at as far as expanding that grocery delivery, we’re going to use the 10 cities as a test and see how customers respond, just like we always do, and make sure that our deliveries are great for those people, and then we’ll announce expansion plans once we digest that, the feedback we get from customers. Great. Thank you. I was just wondering if you could give us a sense, the accelerating growth that we saw in the U.S. business in Q1, how much of that or how would you sort of segment that in terms of specific categories? Are there any specific categories that you would call out in terms of driving that? And then, as we look at the like acceleration in the AWS business, any sense that you can give us in terms of what volumes or customer, you specifically call out sort of customer additions in some of your comments, what customer additions have looked like in terms of driving that business, particularly against sort of the comp against last year’s price cuts? Sure. So first, with the – you’ve mentioned North America revenue growth, and you can calculate that with and without the impact of Whole Foods, I’m sure. But the general drivers continues to be Prime and the Prime flywheel. So we see strong customer demand, not only for the benefits that we associate with Prime, we’re seeing better engagement with Prime benefits, especially digital (11:39) benefits, and that is always good news for eventual sales of other things. We’re also selling more subscriptions, Amazon Music Unlimited, multiple Kindle Unlimited, there’s a number of services. So there’s different revenue streams that we see. So, not much more I can add by product line to North America. And I talk about AWS revenue, again, we’re – we are accelerating. We’ve accelerated for the last two quarters. The FX-neutral growth was 48% in Q1, up from 44% on the same basis in Q4 and 42% in Q3. And now nearly a $22 billion run rate. 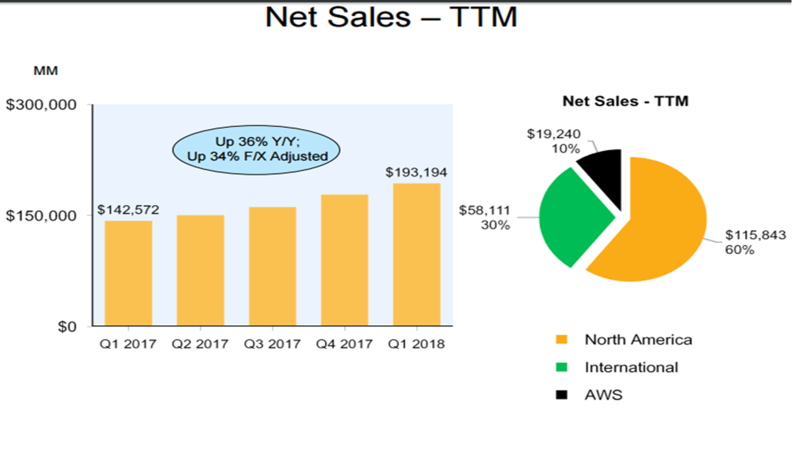 So what we’re saying is just continued strong usage both by existing customers and signing new customers for – see increased pace of enterprise migrations as customers are having success with AWS and increasingly trying new services. We are seeing people move more and more of their workflows to AWS and at a faster pace. And customers are moving databases to AWS as their work (12:45) continues to grow at a very rapid clip. So stepping back, I would say, what is driving the growth, we believe, again, it’s the value that we create for AWS customers. We have the functionality and pace of innovation that others don’t. We have partner and ecosystems that others don’t. And we have proven operational capability and security expertise that’s highly valued to the AWS customer base. Thank you. Some of the data that we’ve seen suggests that this year, the rate of growth in the build out of fulfillment centers and other parts of the retail logistics network as well as data centers, but more on the former, that rate of growth is slowing this year relative to last year and even the year before. I know that you guys go through periods of kind of heavy investment then you grow into that capacity. But I just wonder if you could comment a little bit about where we are kind of in that ebb and flow of that cycle right now. 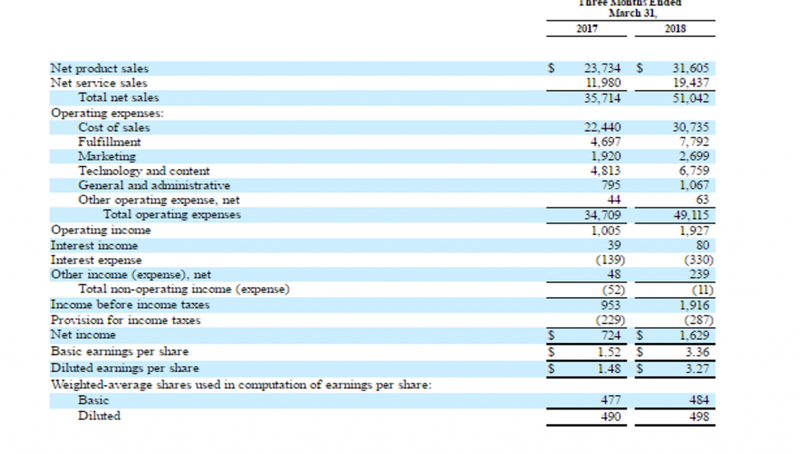 And in terms of the accounting change that Dave referenced earlier with regard to revenue going from cost of revenue to the other line, can you comment if that particular type of advertising, that trade dollars type of marketing, is that growing at a meaningfully different rate than the ad revenue that’s already booked as revenue? Thanks. And on the question on capacity, excuse me, cap – I’ll address this CapEx and capital leases, we’re still seeing strong investment there. If I look at the quarterly trends, you’re right that this quarter was up 33% in isolation versus last year. I look back to last year’s first quarter and we grew 82% year-over-year. So, it was a particularly heavy quarter, particularly for investment in warehouses. So if I step back on the trailing 12 months though, CapEx, which is predominantly tied to our fulfillment center network, is up 47%. 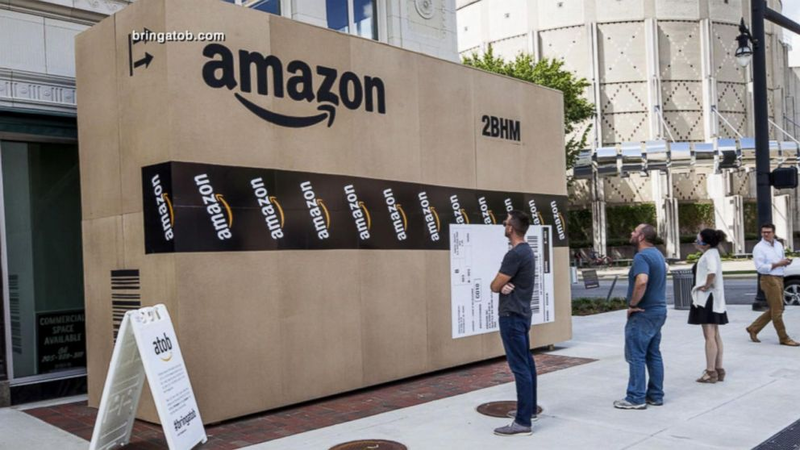 That is above the Amazon fulfilled unit growth rate, but we’ve combined the strength of the FBA program and the space requirements as we – against bigger and bigger products. That’s a representative number for that period. On the capital leases, which is a good proxy for the spend to support the AWS business, that’s up 49% year-over-year on the trailing 12 months. So again, usage rates continue to exceed the revenue growth rates. Usage rates are strong, but we also have a number of projects underway that seek to increase our efficiency of our data centers. So, we have (16:06) a couple of things at play there that hopefully keep that number closer to the revenue growth rate. Thanks for taking the question. Brian, you had significant operating income upside in 1Q and I think a better outlook for the second quarter than many expected. Can you just talk about the biggest factors that drove the delta relative to your 1Q guide? And is there any reason to think that you couldn’t see similar leverage in the back half of the year? Thanks. Sure. Yes, we came in well above our range that we’ve given of $300 million to $1 billion. I would attribute it primarily to a few things. First, the top-line growth was, continue to be strong coming out of Q4. We had great consumer business strength. 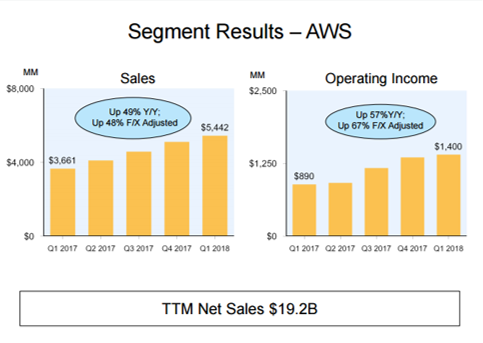 We also had strong AWS revenue strength, where I already mentioned that we accelerated into the quarter, which is a different trend that we’ve seen recently. So customer adoption in AWS remain strong. And when we hit the higher end of our range or just above our range on with FX included, we generally see really good drop through on the incremental sales given the fixed costs we have in fulfillment centers and data centers and quite frankly, people. So we saw great efficiencies at a higher level of revenue, we’re able to handle it. So that was generally very good financially. We – at the time of guidance, we were concerned a bit about the high – relatively high inventory we had at year-end in space utilization. We’re still very full in our fulfillment centers. But we are able to correct that due to the high sales without having additional handling and transportation cost that you would normally see the reconfigure inventory locations. So that also helped and probably differential versus the guidance estimate. And then, lastly, I would say, advertising continues to be a strong contributor to profitability and had strong results this quarter. As far as what that portends for future quarters, for now, I want to focus on Q2 and it’s incorporated into our Q2 guidance. So we expect a lot of the strength areas to continue, consumer demand, AWS and advertising. We will definitely see higher investments as we move through the year. For example, video content spend will increase year-over-year, and we’ll continue to hire, in particular, software engineers. We’ll have some costs in Q2 ahead of what’s anticipated to be a Prime Day in early Q3. So – and then as you know, Q3 is generally a lower quarter due to all the work to get ready for holiday and the hiring of people and building teams. 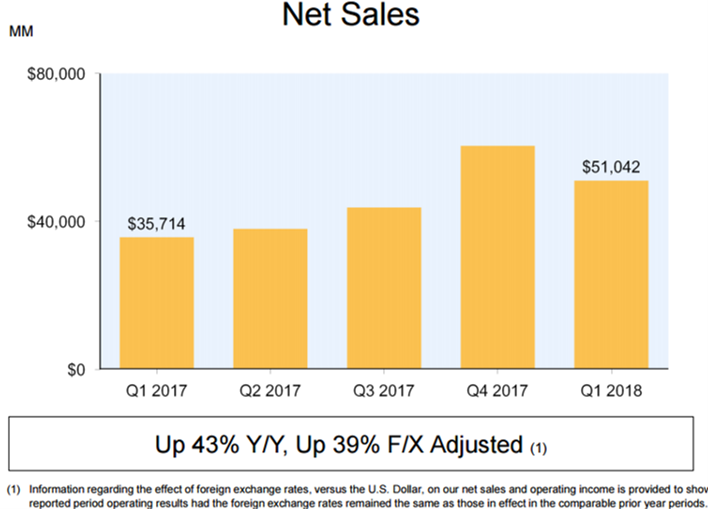 So, I won’t go beyond Q2 at this point, but again, we’re very happy with the customer reception we had in Q1 and then the income that, that drove. Thank you. Our next question comes from Mark Mahaney with RBC Capital Markets. Please proceed with your question. Okay. Great. Thanks. Two questions. The $239 million in other income, what was that? And then could you just wax a little bit eloquently hopefully, on advertising revenue? And like how do you balance what are – what should be a monstrous amount of ad revenue opportunities, especially high profit, high margin ad revenue opportunities against an ideal or optimal consumer experience? These sponsored units I see in every search I do on Amazon seems great from an advertising perspective, but I sometimes wonder if it doesn’t dilute the consumer experience. So just talk about how you balance that. And then finally, as part of advertising, you’ve got also a heck of a lot inventory around all of that video, that Prime Video that you have that you don’t allow – that you don’t directly charge for, how do you think about that as an advertising revenue opportunity? Thank you. Sure. Let me wax eloquently. Try to anyway. So let’s start with the $239 million; that is essentially where attributable to warrants that we have in companies that we partnered with. We have transportation companies that we partnered with and other technology companies. As the stock market increased in Q1, a lot of these companies also went up. So that’s where we book the gain on warrants that we have with – on investments. It’s also – there was a good bit of FX gain due to the shift in currency and the weakening of the dollar. That showed up on a lot of lines on the P&L, but that one was positive. On advertising, so let’s step back a bit. It’s now a multibillion-dollar program and growing very quickly. Our main goal here is to help customers discover new brands and products. So we show the sponsored products, we’re trying to show people things they had maybe wouldn’t have seen otherwise in their normal search results. So we’re looking for a good balance here, as we said. We want customers to get the benefit of the new brand and product discovery, and then we want to let sellers for both emerging and established brands, reach those customers. Those advertisers are of all shapes and sizes with the main goal of, again, trying to reach our customers whether it’s to drive brand awareness, discovery or hopefully purchase. So, we take the responsibility for that very seriously and are always balancing helpfulness of the advertising and try not to make it disruptive. But you’re right, they’re always pressures in that and we (21:54) will come down on the side of the customer. On your question on video advertising, yes, there may be opportunities over time to have more advertising in our Video, but we choose not to do that right now. Yeah, I think the only thing I’d add to on that just related to Prime Video, as you may have seen in the announcement earlier today about the renewed agreement for the streaming partnership with Thursday Night Football. So we’ll have 11 games in 2018 and 2019, be able to deliver that to over 100 million Prime members globally, which is a great continuation of the partnership we’ve had with the NFL. We’ve done some things like the Prime Original Series All or Nothing; the third season’s coming up soon, focused on the Dallas Cowboys. So that was one of our first forays in the live format that – one of the first forays in the live format where we had live ads and kind of, we’re not only learning the technology, but learning to – learning that business. And I think we’ve been pleased with what we’ve seen so far obviously and look forward to the next few seasons with the NFL. Thank you. Our next question comes from Stephen Ju with Credit Suisse. Please proceed with your question. Thank you. So I think, Brian, I had a question on your international shopping rollout, so I think this was recently announced. Where do you think you measure up versus some of the more local players where you might not have a direct presence in the country? And where do you think your value proposition lies? And presumably this is informed by users coming in from those regions where you don’t really have an official site for people come in to buy stuff from you anyway. So, which regions or countries are accounting for most of the demand that you are seeing? Thank you. Stephen, are you’re still on? Can you elaborate more on the countries you’re talking about, specifically? No, I’m just wondering, you already have a direct presence in some of the countries like China, Japan, et cetera, and the international shopping rollout presumably expands all that selection to most of the globe. So just wondering if you are seeing incremental demand, and where you might be seeing demand coming in for countries where you might not have a direct presence? On the global store? Yes. Sorry, I thought you meant some of our expansion countries. Yeah, I don’t have a lot to share on that today, but I think you hit on the main point, is selection and opportunities for sellers in – who are with us in different countries to reach buyers outside of their home country. So, it’s a great benefit for sellers, and it only works if it’s a great benefit for customers on the other side. Thank you. Our next question comes from Justin Post with Merrill Lynch. Please proceed with your question. Yeah, thank you. I’d like to maybe dive into a couple of local recent overhangs. First, on shipping partners, just wondering how dependent are you on any shipping partner? And can you talk about any initiatives you’ve had to build out your own shipping network? I know in some countries, you might be over 50% of the stuff you’re delivering. Could you talk a little bit about dependency there? And then secondly, on taxes, can you remind us what happened when Amazon started collecting taxes on your own items in various states and just kind of overview of your view on collecting third-party sales – taxes from third parties in other states if that were to pass? Thank you. Sure. Let me start with transportation. We have a great group of carriers that we use globally and you know who they are. But we’re also growing our teams and capabilities to ensure that we can keep up with increased volume on our own, particularly around the holiday season. So that’s driven a lot of our expansion of Amazon Logistics, it’s driven the creation of sort centers; it’s driven the purchase of airplanes to move product between points within our delivery network. So, we will continue to operate with this combination of external partners and internal capability. We like what we see so far with our Amazon Logistics’ capability. It’s well over 50% in some countries, particularly the U.K. It helps with again Prime Now and AmazonFresh and a lot of initiatives that we’ll see which again we mentioned the Prime Now is tied in with Whole Foods, now in 10 cities. So we think it’s a core competency that we have and we need to have and we’ll continue to invest in that. Yeah, and Justin, this is Dave, just on the sales tax piece. Today, on the first-party sales, we collect on our own products in all 45 states that have a state-imposed sales tax. On the 3P piece, we do collect on behalf of our sellers in two states, Washington State as of the first of this year, and then Pennsylvania turned on here on April 1st. So in terms of your question of sort of impact from the first-party piece that’s coming online, many of those states came on over a period of time to get to that 45 total going back over many years. So, nothing really more to add on that. I think I would say we do continue to believe that the sales tax issue needs to be resolved at the federal level, and we’re actively working with the states, with retailers and Congress to get federal legislation passed. We’re not opposed to collecting sales tax within the Constitution and the permissible system that is both simple and applied evenhandedly. Thank you. Our next question comes from Greg Melich with MoffettNathanson. Please proceed with your question. Hi. Thanks. So I want to follow up on Prime little bit. The fee increase, why now? I mean, we’ve been adding value for a long time obviously shipping costs are going up. Why is now the right time to have that fee hike especially since membership looks like the growth numbers starting to slow? And tied into that, there’s a lot of Alexa mentioned in the release. Could you give us some uptake on the importance of Alexa and basically voice commerce, and so the metrics you get in terms of usage there and the flywheel? Thanks. Sure. We always evaluate the price of Prime in all the countries we’re in and we’re looking for creative ways to reach the customer. As I mentioned earlier, create or, excuse me, monthly plans student plans et cetera. So it’s really nothing more than looking at the state of the program. The high benefits it’s delivering. I mentioned that four years ago when we last increased the price of Prime if you get 20 million products within two days, today you’re getting over 100 million products within two days, and many, many products within one day, same day or two hours. So there’s all kinds of new features that we’ve continually added to the Prime program. It’s much different than it was in 2014. This is a reflection of that, that’s a better reflection of the cost value of the program. Sorry go ahead. Our next question comes from John Blackledge with Cowen and Company. Please proceed with your question. Great. Thank you. So the U.S. international revenue mix, ex-Whole Foods and ex-AWS looks about 64%, 36%. Given investments in the international markets would you envision international kind of closing the gap in the coming years? And what would be the key drivers of the mix shift getting closer to 50-50? Thank you. Sure. Yeah I don’t want to project relative proportions of the different segments, but what I can say is the international continues to see the same level of investment as we’re seeing in North America or have seen in North America. So when we add benefits, Prime benefits, we’re probably adding them at an earlier stage of life in the Prime program internationally than we did in the U.S. So, they have different dynamics. We think at the end of the day customers behave the same globally and that they value low prices selection and great customer experience. So, we’ll continue to make these investments in Prime. We’ll continue to expand selection, continue to build FBA programs so that it increases selection even more and builds great partnerships with sellers. We’ll continue to accelerate shipping. We’ll continue to lower prices. And sorry I cut out the last person [Technical Difficulty] (30:50-30:30:55) including Alexa, which we think has great stickiness with, in the home and I think creates a lot of value in the home and also allows you to access over time Amazon products better. We’ll continue to invest in India where we’re seeing great progress with both sellers and also customers. And we like the momentum we’ve seen there. The Prime program started in the first year in India grew faster than any Prime program we’ve seen in other countries. We’re adding local content in India, video content, excuse me. We’re also adding other benefits, Prime benefits. We’re rolling out devices there, and we’re seeing Indian developers developing skills for Alexa, and Alexa is up press (31:43) release to 40,000 [Technical Difficulty] (31:46) Yes, but it’s – it is important to us that they all are still delighting customers and growing to the best of their ability. Thanks Brian. And thanks for joining us on the call today and for your questions. A replay will be available on our Investor Relations website at least through the end of the quarter. We appreciate your interest in Amazon.com, and look forward to talking with you again next quarter.